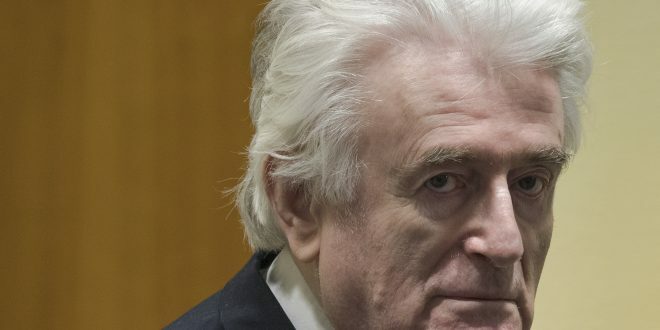 Appeals judges of the U.N. War Crimes Tribunal for the former Yugoslavia have upheld Radovan Karadzic’s conviction for genocide in the 1995 Srebrenica massacre that claimed the lives of some 8,000 Muslim men and boys. They also ruled that the 40-year sentence of Karadzic handed down in the first trial, in 2016, was too light given the gravity of the crimes. Along with the late Serbian President Slobodan Milosevic and Serbian army general Ratko Mladic, Karadzic was a key figure in the Bosnian war. International tribunals have held that the Serbs systematically killed and expelled the Muslim and Croat populations from Bosnia with the aim of ethnic cleansing. Wednesday’s ruling will resonate in Bosnia – where the war claimed at least 100,000 lives, where ethnic groups are still divided, old animosities are still strong and Karadzic is still seen as a hero by many Bosnian Serbs. Karadzic was arrested in Belgrade in July 2008, 10 years after he had gone underground. He disappeared after he had been indicted for war crimes by the U.N. court in The Hague. When he reappeared, he had a new identity. He had been passing himself off as a new-age health guru, practicing alternative medicine, writing articles and even lecturing under an alias. For years, there were rumors that Karadzic was in Bosnia or in Montenegro, hiding in monasteries or even caves. There were also reports that NATO peacekeepers based in Bosnia knew exactly where he was but declined to arrest him. As it turned out, he spent most of his time on the run hiding in a Belgrade neighborhood of anonymous-looking high-rise buildings, where it was easy to blend into the scenery and lose one’s identity, especially if in disguise. When arrested, Karadzic looked completely different: shoulder-length white hair, white beard — more like a character out of a Tolkien novel than the very showy, pompous wartime leader remembered by reporters who covered the Balkans. Originally trained as a psychiatrist, Karadzic as a fugitive passed himself off as an expert in what he called “human quantum energy.” He used the name D.D. David, or Dragon Dabic, and gave lectures all over Serbia on alternative medicine. He even had a website and was a regular contributor to the Serbian alternative medicine magazine, Healthy Life, signing off his articles as a spiritual researcher. His editor was reportedly shocked to learn his true identity. The Bosnian Serb leader remained a fugitive for so long thanks in large part to a strong support network of hard-line nationalists and help from the Serbian Orthodox Church and protection from high Serbian authorities. His arrest came just after a new government was installed that was keen to end Serbia’s international isolation – and that depended on handing over remaining war crimes suspects to the International War Crimes Tribunal. In The Hague, Karadzic faced many serious charges: genocide, extermination, murder and ethnic cleansing. As well as the Srebrenica massacre, he was accused of ordering the 43-month-long siege of Sarajevo during which Bosnian Serb troops starved, sniped and bombarded the city center and in which thousands of civilians lost their lives. The tribunal described Karadzic as the suspected mastermind of scenes from hell, written on the darkest pages of human history. The first trial began in October 2009 and Karadzic acted as his own lawyer – a fact that haunted the tribunal. By defending himself in court, Milosevic had succeeded in delaying the proceedings, and he died of a heart attack four years into his trial. Karadzic followed Milosevic’s example of using the courtroom for political grandstanding. He insisted the tribunal had no right to try him because he claimed he had struck a secret deal with then-U.S. envoy to the Balkans Richard Holbrooke. Holbrooke denied the existence of such a deal. Karadzic, 73, was raised by a Serb nationalist family. As a psychiatrist, he specialized in depression. He was also an amateur poet. In 1992, he led his Bosnian Serb splinter state to war. He was also an inveterate gambler who loved poker, and in the early months of war, reporters would often track him down in gambling casinos. But today in The Hague, Karadzic lost his final hand against international justice.